The introduction to every keyboard review goes a little something like, "Since the dawn of time, man has bashed on the keyboard and mouse, and in that time, very little has changed...". And indeed, it hasn't changed very much. The primary interface we humans use for these computer thingies are our fingers - the very same fingers we use to dig in your ear, point rudely at things, carefully feel that weird lump on the back of your neck and various other mundane - and possibly gross - activities. Fingers on the whole are slow, and as wieldy as tree trunks, when abstractly compared to the speed and power that is a modern computer. Neuromancer - and more recently, The Matrix - feature the concept of a direct connection to the brain and spinal column, and while this seems like a pinnacle goal for interface nutters to aspire to (me included), science knows so little about the brain at the moment. This could may lead to the situation of trying to open a webpage in the browser of your mind, but instead, random spam about Viagra and deposed Nigerians overwrites your speech centre instead. More research is required before I let them hardwire something to my brain. We could also do a revamp of the keyboard, but this has been done so many times, with varying degrees of success. Dvorak tried first, with a 'simple' rearrangement of letters on the keyboard, and while proponents swear by its efficiency, the uptake hasn't been exactly stellar. There have also been attempts to physically rearrange the keyboard itself, either splitting it, turning it on it's side, making each finger have it's own three dimensional key 'pot', and so on. None of these have dramatically increased the speed of interaction with computers, they've just made our fingers hurt less (or more, in some cases). In the end, there is always voice and speech recognition. The technology for voice recognition has been around for over 30 years, but it wasn't until the last 10-12 years or so that personal computing power was able to compare an audio input to stored templates with anything approaching home usage levels of capability. It was very slow and unwieldy first, and in 1994, I owned a Covox VoiceBlaster, which comprised of a microphone headset, a LPT port dongle that the headset plugged into, and the relevant software. Sadly, this no longer works, and even if it did, I have no idea where to find a 5.1/4" drive to load the software. While it did work, in a way, it was not very good. I would have to create commands myself, then specify what actions would be carried out by the software. It was rather CPU intensive, not 100% accurate, and while it would work with games, it wouldn't always do the job - a running joke with some mates is how I would mutter "Flare" repeatedly during multiplayer sessions of Descent, without success. Although it did have its uses, the Voiceblaster was really audio recognition software, rather than true voice/speech recognition. It matched a sound pattern to a specified command – usually the entry of a particular character or keypress sequence. Back then, serious voice recognition was an unwieldy, but better-than-nothing technology - primarily for people with disabilities, giving them direct control of a computer. But now, it's become useful to pretty much anyone who writes a lot, or is looking for a different interface to their computer. So, even though the practical uses of speech and voice recognition software have historiclaly been rather limited, we're now starting to see it come more into the mainstream. 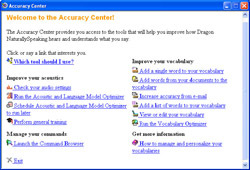 Enter Nuance Communication's Dragon NaturallySpeaking 9, which is a completely software-based speech recognition solution. VoiceRecognition.com.au were kind enough to send over the 'Preferred' version, which includes the Standard version with some extras. The Standard version appears to be purely voice/speech recognition software, with the marketing blurb stating,"E-mail, instant messaging, and chat rooms have never been so much fun. From kids to grandparents, Dragon NaturallySpeaking Standard will make using the PC easier and faster for the whole family." The Preferred edition, however, includes extra functionality for users by including command templates that give control over various applications, including "Microsoft® Word and Excel®, Corel® WordPerfect®, and virtually all Windows®-based applications." 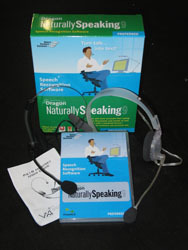 There is also a "Business & Professional" set of NaturallySpeaking on offer, including the Medical, Legal and Professional editions. The legal and medical editions are obviously meant for those relevant work environments, with extended template libraries full of legal and medical jargon which isn't normally available in the Preferred and Standard editions. You could, of course, train those versions to recognise "methylhydridephyloparasulphate" and the other 3 million other drugs and compounds available, but I'd suggest that it's probably less painful to shell out the extra cash and let Nuance do the work for you. Obviously, the actual software itself is included in the package - the Preferred version comes on two cds - and depending on what package you purchase, a headset will be included. VoiceRecognition.com.au also sent us the standard headset, which is pretty much like every one-eared, microphone headset known to mankind, and a higher quality Andrea NC-1700 Digital USB headset. The NC-1700 features translucent plastics, and has a decent quality feel about it, which you would expect considering it costs $149 by itself. It has a small box containing the brains of the headset, which sprouts the USB connector at one end, along with a 3.5mm jack for connecting the one-ear speaker to the computer output. A cable is supplied for this, but it's not very long, and frankly, they've already got USB connectivity there, why not include audio output as well? It boggles the mind why they'd skip that, but that's not the fault of Dragon NaturallySpeaking. The quality of both the microphone and the single ear cup of the NC-1700 are of a higher level than most headsets, but would you pay $149 for it? Probably not by itself, but it does come as a discount when bundled with NaturallySpeaking, and as it generates a higher quality audio signal, you're less likely to experience errors when dictating to the software. Even though NaturallySpeaking 9 works pretty well right after installation, there is some work you will have to do with NaturallySpeaking, and that comes in the form of training. Even though it's very good straight off, thanks to personal accents or speech impediments it won't be 100%. However, the accuracy skyrockets when you create a profile and train the dickens out of it. Luckily the training isn't particularly difficult - it consists of watching included instructional videos and reading passages of text onscreen to NaturallySpeaking, allowing it to build a profile of your personal speech idiosyncrasies. However, the passages it requires you to read are huge in the intermediate training, and can easily take an hour or more to get through. If you do this, keep a glass of water handy because your throat will dry out quickly. Even though it can be painful and boring to run through the training, it will improve the accuracy of NaturallySpeaking when it comes to everyday language and commonly used words. There is also an interesting little option for NaturallySpeaking to interface with your favourite email client and expand its vocabulary based on outgoing emails and personal writing style. 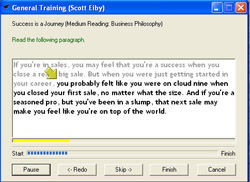 I’m a bit sceptical about this tool adding real benefit though, as a large majority of people talk very differently to the way they write their emails, however since NaturallySpeaking is helping to create documents – that would be presumably written in a similar style to email – it may have some positive effects. 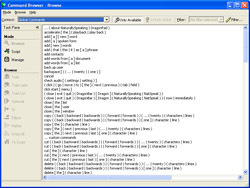 Also accessible via the Accuracy Center is the Command Browser, a tool that allows the user to view, edit and add commands for use in controlling Windows and whatever application is currently in focus. Commands can be set to be ‘Global’ or for a specific application. This scripting side of the Command Browser appears to be quite powerful, even though I’m a complete klutz and couldn’t get a test command to work. This is more likely to be the fault of the reviewer being slow, than any flaw with the scripting interface.